People can use Dynamics 365 App for Outlook to tap the power of Dynamics 365 for Customer Engagement while using Outlook on the desktop or web. For example, view information about email or appointment recipients, or link an Outlook email or appointment to a Dynamics 365 for Customer Engagement record such as an opportunity, account, or case. 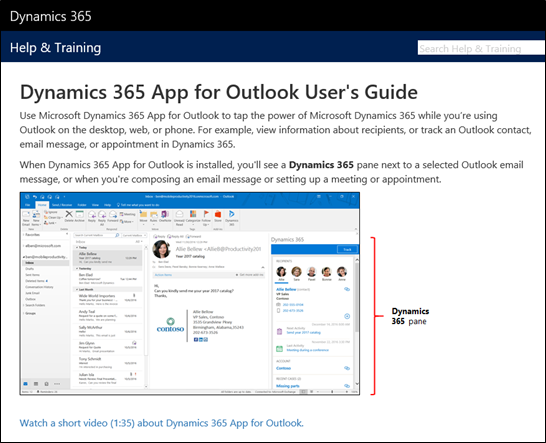 To learn more about what Dynamics 365 App for Outlook offers, see the Dynamics 365 App for Outlook User's Guide. Dynamics 365 App for Outlook isn’t the same thing as Dynamics 365 for Outlook. As of the December 2016 Update for Dynamics 365 (online and on-premises), Dynamics 365 App for Outlook paired with server-side synchronization is the preferred way to integrate Dynamics 365 for Customer Engagement with Outlook. Note that tracking activities is not supported when Dynamics 365 App for Outlook and Dynamics 365 for Outlook are used together by the same user. For information on the Dynamics 365 for Outlook add-in, see the Dynamics 365 for Outlook User’s Guide. Delegated users can not use Dynamics 365 App for Outlook to track emails. We suggest using folder-level tracking or automatic tracking for delegated users. There are two ways to install Microsoft Office: using a Windows Installer (MSI) version or a Click-to-Run (C2R) version of Office. You might have issues accessing Microsoft Dynamics 365 for Customer Engagement apps in the Add-ins area of Outlook if you don't have the necessary updates for your installation version. For more information, see Issue when trying to access Dynamics 365 for Customer Engagement apps within the Add-ins area of Outlook. The following table compares Dynamics 365 App for Outlook features with Dynamics 365 for Outlook (also known as the Outlook client or add-in) as of the December 2016 Update for Dynamics 365 (online and on-premises). Users must also have read/write privileges for the following entities. If you use Customer Engagement (on-premises), you'll need to authenticate with IFD authentication as described below. Outlook 2013 and Outlook 2016. Exchange Server version 15.0.1236.3.32 (Cumulative Update 14 for Exchange Server 2013) or greater is required. Apple iPhone devices running iOS version 8, 9, or 10. Android phones running Android 4.4 (KitKat) or 5.0 (Lollipop), 6 (Marshmallow), or 7 (Nougat). Windows Phone devices running Windows 8.1 or Windows 10. The Dynamics 365 App for Outlook features supported depend on the client you're running. The following table summarizes which features are supported for each client/configuration of Customer Engagement and Exchange. (1) Outlook on the web supports Internet Explorer 10, Internet Explorer 11, Microsoft Edge, Safari 9, Safari 10, Firefox, and Chrome. (2) Mobile Outlook on the web supports Windows 8.1, Windows 10, iOS 8, iOS 9, iOS 10, Android KitKat (4.4), Android Lollipop, Android Marshmallow, and Android Nougat. (3) Tracking email in compose mode and tracking appointments requires Exchange Server 2013 CU14 or Exchange Server 2016. (4) Tracking contacts is supported only on Exchange Server2016 CU3 and Outlook 2016 16.0.6741.1000 and later. (5) Adding email templates, Knowledge Management articles, and sales literature is not supported in Mobile Outlook on the web. (6) Supported only on Outlook 2016 16.0.7426.1049 and later. (7) Supported only on 16.0.6741.1000 and later. (8) Supported on iPhones 6S or higher, with iOS 8 or higher. Tablets are not supported at this time. Users click the Settings button , and then click Apps for Dynamics 365 for Customer Engagement apps. In the Apps for Dynamics 365 for Customer Engagement apps screen, under Dynamics 365 App for Outlook, users click Add app to Outlook. Follow these steps if you're using Dynamics 365 for Customer Engagement apps (on-premises). Configure your Dynamics 365 for Customer Engagement apps server for Internet-facing deployment. See Configure IFD for Microsoft Dynamics 365 for Customer Engagement apps. If you are using Dynamics 365 for Customer Engagement apps (on-premises), you need to enable OAuth on the Dynamics server, and register the Dynamics 365 App for Outlook with ADFS. You also need to make sure that OAuth us enabled for Exchange. See Configure Windows Server 2012 R2 for Dynamics 365 for Customer Engagement apps that use OAuth. If you or your users have trouble installing Dynamics 365 App for Outlook, it may be because their Exchange mailbox is currently linked to another Customer Engagement organization. An Exchange mailbox (email address) can only synchronize appointments, contacts, and tasks with one organization, and a user that belongs to that organization can only synchronize appointments, contacts, and tasks with one Exchange mailbox. You can overwrite the setting stored in Exchange if you want to change the primary synchronizing organization. For more information, see this KB article.